To start setting your preferences open the Options dialog by selecting the Tools > Options… menu item on the main window of Ubiqua. You will find more instructions on the following sections. Ubiqua will help you recover the last capture if an error occurred recently and the application closed unexpectedly. When the application is started it checks for orphan files and presents a Capture Files Recovery dialog where you can select from a list of recoverable files with the corresponding date and time of when the problem occurred and the number of packets, select the file and click on the Recover Capture button and all the packets will be automatically loaded on your Traffic view. 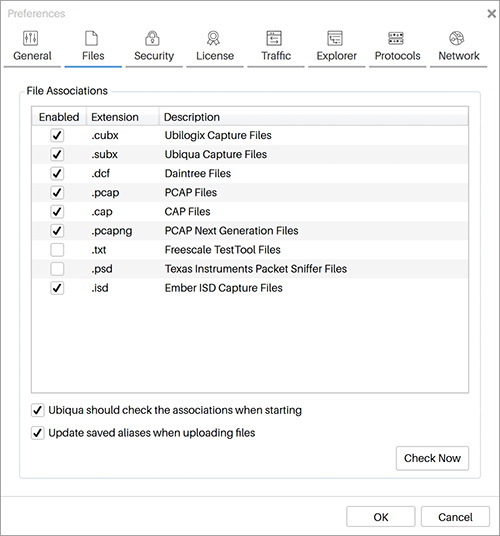 The ‘Auto Save’ feature automatically creates segmented files of live captures, allowing the user to set the option to save capture files every certain number of packets or determine a time interval to perform this task. This feature is helpful for cases where there will be long periods of capture time. When enabled, Ubiqua may generate multiple files in the path that was indicated, each file will contain a segment of the full trace. To enable this feature, open the ‘Tools > Options’ menu, go to the General tab and find the ‘Auto Save’ section. Below the ‘Location’ field you can find the ‘Clear capture after use auto-save’ and ‘Automatic Compatibility’ options. When the ‘Clear capture’ option is checked, every time the 'Auto Save' task is performed, the ‘Traffic View’ will be automatically cleared, deleting all the capture packets that were saved from the window, and displaying only those packets that will be part for the next ‘Auto Save’ segment. If the ‘Automation Compatibility’ option is selected by the time an unexpected close occurs, Ubiqua automatically will restart and will not show any of the dialogs (i.e. capture recovery, crash report) , which makes it a good choice for those who are running automated tests. Recovery dialogs are available throughout the main menu inside the application. Ubiqua implements dialogs to remember the user's choices within the system. This option is used to remember the user preference and to suppress the same dialog in the future. The dialog appears when a capture file that does not contain protocol information is opened. The user can choose one of the supported protocols to decode it and selecting 'remember my choice' set the selected protocol as default to open the following captures. A dialog opens if the Frame Check-Sum validation fails, and the user can choose among to append 2 more bytes with the correct checksum, to replace the last 2 bytes with the correct checksum, or do nothing; the "remember my choice" will suppress the dialog when opening following captures. Finally, a dialog will open each time a new filter is created or the selected filter is edited; the "remember my choice" will suppress the dialog and it will apply the last user's choice. The stored dialog selections can be reset using the "Reset all dialog warnings and stored choices" box on the General tab. This option toggles on or off the Ubiqua Services which are web resources that expose certain Ubiqua functions for convenience. See here for more info. 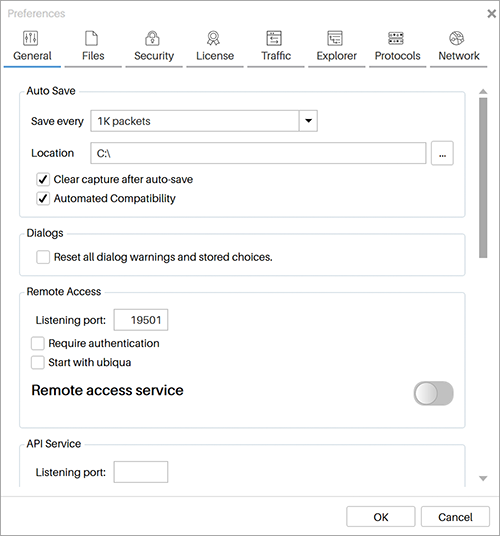 From this section you can change default protocol settings for unrecognized loaded capture files and customize other decoding options, such as the CoAP Custom Port that allows Ubiqua to listen on a designated UDP port and decode incoming traffic as CoAP. 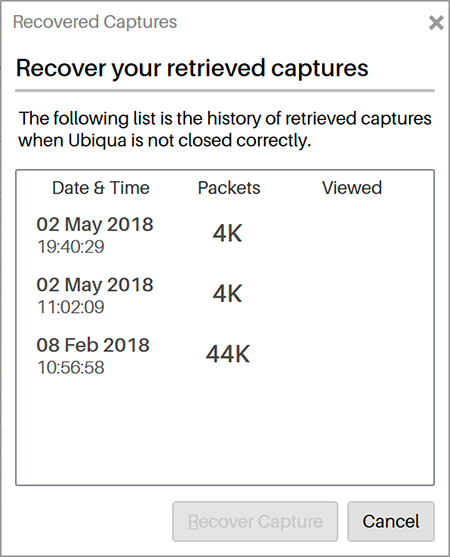 You can set up Ubiqua to open capture files by double clicking on them in your system. 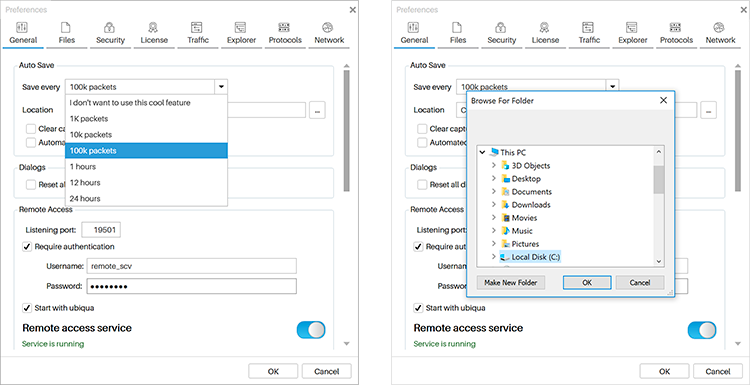 To do so, open Options dialog, select the Files tab, and you will see a list of the supported capture files and extensions. Click the checkboxes on the Active column to associate Ubiqua to that file format. Use the checkbox at the bottom to make Ubiqua check if the associations are correctly set on your system each time it starts. Security keys for decoding purposes are managed on the Security > Keychain tabs of the Options dialog. In this tab, you are presented with a list of all the security keys available in Ubiqua. This keys could have been discovered in the capture data or they could have been added manually. Use the buttons on the right to add, edit, delete, or import keys. By right clicking on one of your Graphic View’s devices and select the ‘Customize’ option in the context menu. It can also be opened from the 'Properties View’, by clicking the ‘Customize’ button located in the ‘Customizable Properties’ expander below the ‘Alias’ input. By right clicking on a device in the list of Devices in the ‘Tools’ >‘Options’ ‘Network’ > ‘Devices’ tab. 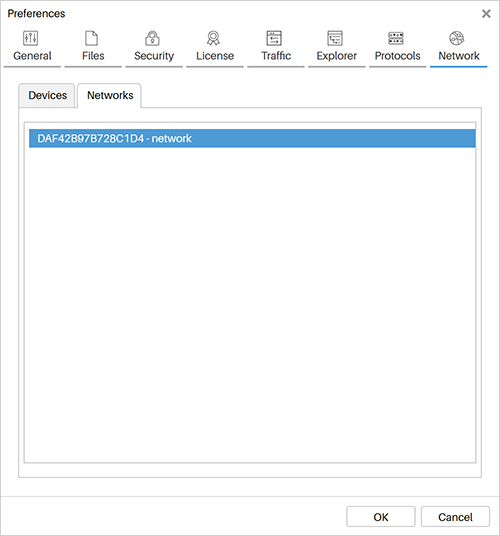 When you need to have an organized list of your networks you can customize their alias, this will make them appear listed in the Tools > Options > Network > Networks tab. Each item on the list will be composed of the extended PAN ID id followed by the custom alias you assigned, networks without a customized alias will not appear in the list. 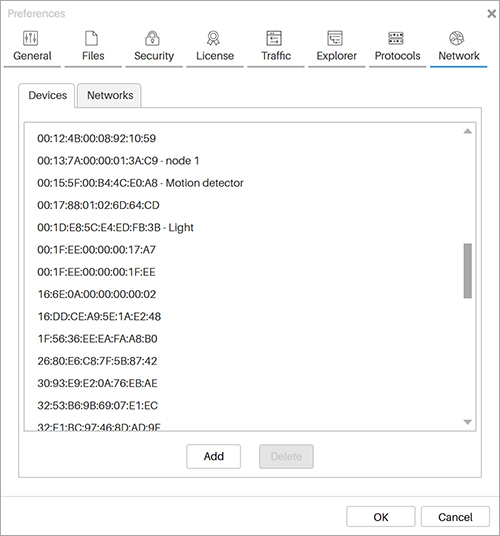 Group the devices by PAN in the Network Explorer view. (click here for details on how to group devices). Within the Network Explorer tree visualization select the PAN node that has the PAN ID and Extended PAN ID attributes of the network. Go to the ‘Properties View’ where the information of the network will be automatically loaded. At the bottom of the 'Properties view' Uncheck the 'Use default alias' box to make the ‘Alias’ input editable. Type your network alias, click outside the text input. The PAN node in the Network Explorer view will be automatically updated, replacing the default PAN ID alias with the new one. The customized element will be added to the mentioned list of networks within the Tools > Options > Network > Networks tab. 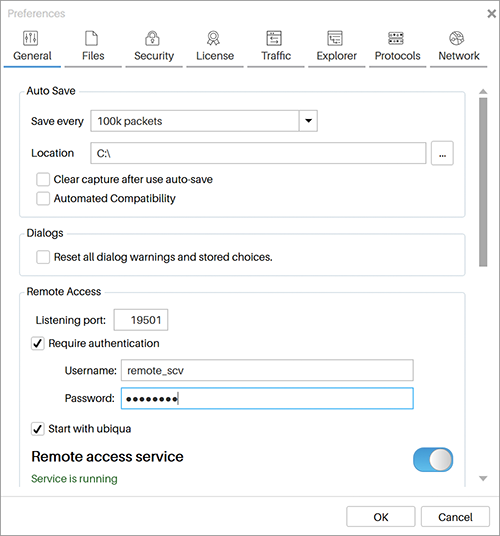 The License Management option is the most important part of the Options dialog. You will find it in the License tab. Here, you can see who the owner of the license is (name, email, and business). At the top right section, the status of the license is shown in terms of how many remaining days are left for the license to be valid (in case of the 21/days evaluation) or the number of days left of support (in case of a full license). Your Computer ID is also displayed on this section. Ubilogix uses this ID to match your license with your computer. Many of the actions of your license (such as transferring), are linked to this number so be sure to include it when requesting changes to your license to support@ubilogix.com. Use the buttons at the bottom to upgrade your current license to a more inclusive one, to start the license transfer process, or to regenerate your certificate file. Note that an active Internet connection is required for all these processes. The Check for Updates option is not included on the Options dialog. You will find it on the Help > Check for Updates… menu item. 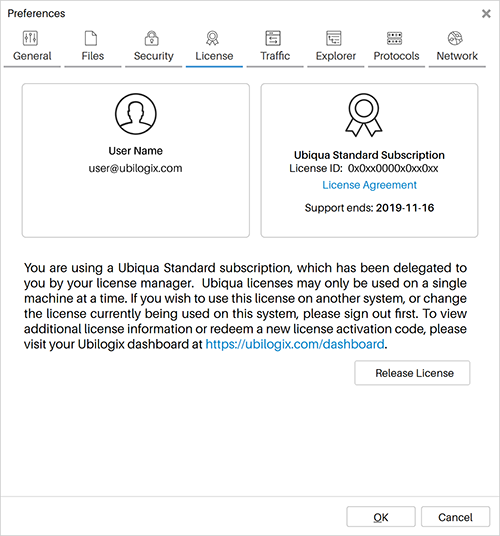 Use this option to know if a new version of Ubiqua is available, and if you are entitled to it (according to your license). Environment files are loaded and saved from the File > Load/Save Environment menu items. 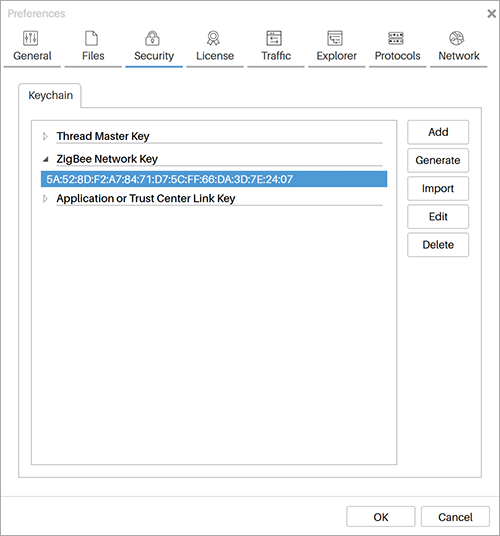 These files include all the current selections and values of the Options dialog including address relationships, security keys, and others. Environment files do not store any license information.